Getting something from nothing sounds like a good deal, so for years scientists have been trying to exploit the tiny amount of energy found in nearly empty space. It’s a source of energy so obscure it was once derided as a source of “perpetual motion.” Now, a research team including Princeton scientists has found a way to harness this energy using a silicon-chip device, potentially enabling applications. This energy, predicted seven decades ago by the Dutch scientist Hendrik Casimir, arises from quantum effects and can be seen experimentally by placing two opposing plates very close to each other in a vacuum. At close range, the plates attract each other. Until recently, however, harnessing this “Casimir force” to do anything useful seemed impossible. A new silicon chip built by researchers at Hong Kong University of Science and Technology and Princeton University is a step toward harnessing the Casimir force. 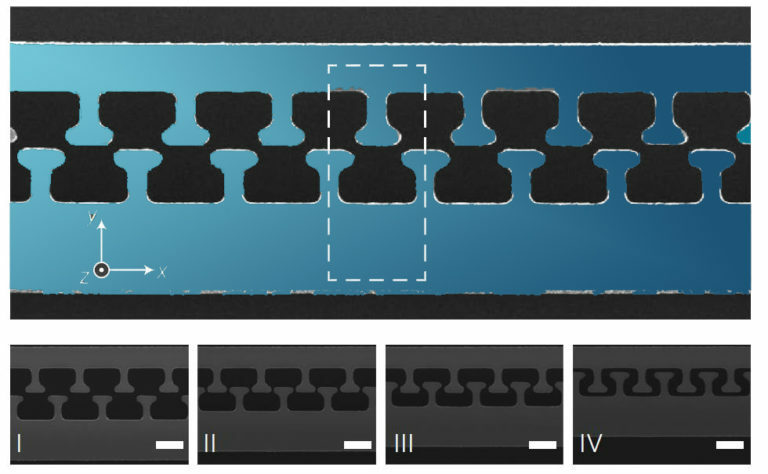 Using a clever assembly of micron-sized shapes etched into the plates, the researchers demonstrated that the plates can instead repel each other as they are brought close together. Constructing this device entirely out of a single silicon chip could open the way to using the Casimir force for practical applications such as keeping tiny machine parts from sticking to each other. The work was published in the February issue of the journal Nature Photonics. The silicon structure looks like two plates lined with teeth that face each other across a tiny gap which is only about 100 nanometers wide. (A human hair is 60,000-80,000 nanometers wide.) As the two plates are pushed closer together, the Casimir force comes into play and pushes them apart. This repulsive effect happens without any input of energy and to all appearances, in a vacuum. These characteristics led this energy to be called “zero-point energy.” They also fueled earlier claims that the Casimir force could not exist because its existence would imply some sort of perpetual motion, which would be impossible according to the laws of physics. The force, which has since been experimentally confirmed to exist, arises from the normal quantum fluctuations of the few atoms that persist in the chasm despite the evacuation of all the air. The team demonstrated that it is possible to build a device in silicon to control the Casimir force. “Our paper shows that it is possible to control the Casimir force using structures of complex, tailor-made shapes,” said Ho Bun Chan, senior author on the paper and a scientist at the Hong Kong University of Science and Technology. His team drew on earlier work by Rodriguez published in 2008 that proposed shapes that would be expected to yield a Casimir force that could both attract and repel. “This paper is the experimental realization using a structure inspired by Rodriguez’s design,” Chan said. Rodriguez and his team at Princeton developed techniques that allowed the researchers to compute interactions between two parallel plates as they approach each other. With these tools, they were then able to explore what would happen if more complex geometries were used. This led to some of the first predictions of a repulsive Casimir force in 2008. The Rodriguez group used nanophotonic techniques, which involved measuring how light would interact with the structures, to get at the complex equations of how the force arises from the interaction of two plates. The silicon device included a small mechanical spring that the researchers used to measure the force between the two plates, and to verify that the quantum force can be repulsive. The roughly T-shaped silicon teeth are what allow the repulsive force to form. The repulsion comes from how different parts of the surface interact with the opposite surface. “We tried to think about what kind of shapes Chan’s group would have to fabricate to lead to a significant repulsive force, so we did some background studies and calculations to make sure they would see enough non-monotonicity as to be measurable,” Rodriguez said. Going forward, the researchers plan to explore other configurations that may give rise to even larger repulsive forces and more well-defined repulsion at larger separations. Funding for the study came from the Research Grants Council of Hong Kong and the National Science Foundation (grant no. DMR-1454836). The paper, “Measurement of non-monotonic Casimir forces between silicon nanostructures,” by L. Tang, M. Wang, C. Y. Ng, M. Nikolic, C. T. Chan, A. W. Rodriguez and H. B. Chan was published in the journal Nature Photonics online Jan. 9, 2017 and in the February 2017 issue. Nature Photonics 97–101(2017) doi:10.1038/nphoton.2016.254.